The quartfoil panel at the top of the east window dates to the original building of the church. This shows Jesus in royal robes and seated in judgement. It was the gift of Hector Nelson, first priest in charge and later (in 1857) the first incumbent of the newly independent parish of West Pinchbeck. 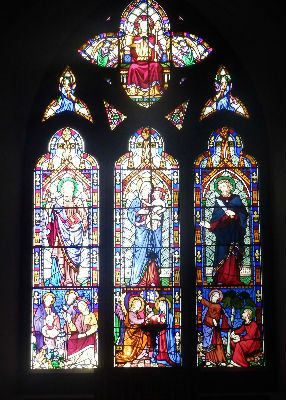 His wife, Mary Nelson, later collected donations from her relatives in Kent, to fund the main centre panel of the window. The top section shows Mary with the child Jesus. The lower section depicts the Annunciation story. Shortly after the death of the third vicar, Revd Benjamin Trapaud Smyth in 1859, his widow installed the right hand panel. The upper part depicts St Paul while the lower section shows the Church's patron St Bartholomew, assumed here to be co-identical with the biblical Nathanael, seated under his fig tree. The left hand panel was funded by the Laxton family in memory of their mother. In the top section it features St Peter and in the bottom, Saint Philip finding the lad with five loaves and two fishes. The easternmost of the small lancet windows in the chancel depicts Jesus as the Light of the World. The dedication is for Thomas Atkinson, Churchwarden from 1873 to 1878. The westernmost of the small lancet windows in the chancel depicts the Ascension of Jesus, and is dedicated to the memory of William Hooson, priest. This was installed in 1903 to commemorate the lives of both Canon West Wayet, who founded St Bartholomew's, and his wife Ann, whose generosity helped to launch the restoration of the crumbling building some fifty years after its consecration. Most suitably the window depicts Christ the Good Shepherd - a template Canon Wayet clearly followed in ministering to the flock of the Parish. A modern and otherwise plain window in the north aisle is dedicated for local farmer and churchwarden Walter Dobbs (1833-1955), and his wife Sarah Caroline (1868-1955). The left hand panel declares `the seed is the Word of God' and the right: `The reapers are the angels'. 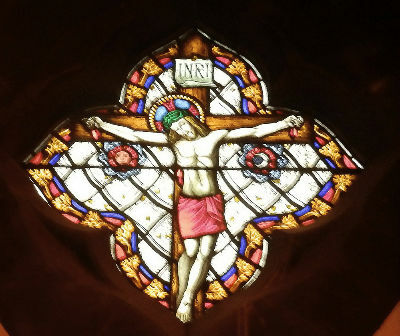 Located at the east end of the north aisle, and from an artistic perspective arguably the finest piece of stained glass in the building, this small quartfoil window depicting Jesus on the cross was presented by a Miss Elsdale (cousin of Hector Nelson) and installed when the church was first built. When the church was restored some fifty years later, there was a plan to install an organ loft between the end of the north aisle and the vestry, but as this would have necessitated removal of the quartfoil window (with no other suitable location for its display) the plan was abandoned.